It’s no surprise that Bayern Munich have already concluded negotiations for Benjamin Pavard, he will officially be unveiled at the end of the 2018/19 season. For those that don’t know about Pavard, if you watched the World Cup, he’s that French defender who scored the absolute thunderbolt that Zidane himself would be proud of! Although he’s shown that he has top quality technical ability, he’s not actually a proven goalscorer, he’s a centre back or sometimes a make-shift right back. He proved during the World Cup that he has the quality required to make it at the top level, but I was left surprised that Liverpool didn’t come in for him, I know they have Trent, but healthy competition doesn’t hurt (plus he is also a centre back and he’d match up nicely with Van Dijk!). I was even more confused that no clubs made an offer, as he only sold for £35m, which in this market, won’t buy you a backup goalkeeper! From a Football Index point of view, I am concerned as to what this does for Kimmich. Does Kimmich move to DM? or does Pavard form a CB partnership with Sule, which could last for the next 8-10 years? One thing for sure, Bayern definitely look strong now. Discounting Boateng & Hummels, who are elite defenders but ageing, Alaba, Sule, Pavard, Kimmich would be a strong defensive line. Bayern are definitely starting to overhaul their squad, acknowledging that Ribery & Robben are past their peak, they have already purchased Alphonso Davies & rumoured to be signing Werner. Bayern will definitely be a force to be reckoned with, I will personally be excited to see Pavard cement his place in the squad, most likely at centre back. Having watched him progress from Lille, it’s great to see him making a further step up. In the meantime, Stuttgart have made £30m profit after just 18 months of owning Pavard, which is good business for them! Next in line would probably be Timo Baumgartl, another youngster with heaps of potential who has already represented Germany in the U15, U16, U18, U19 & U21’s. Will he follow the path of Pavard and kick on? 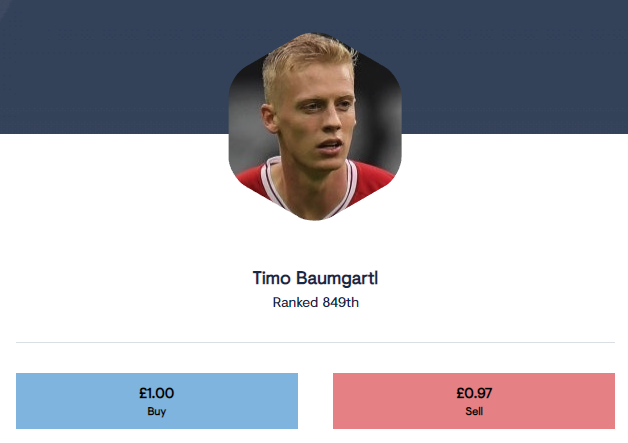 Benjamin Pavard has won £0.00 in dividends, with combined Media & Performance Buzz. He is priced at £1.94 currently, at time of writing. You may be confused at why I have rated him 5/10, but that’s because Stuttgart are currently sat in the relegation zone. This means he has little chance of achieving the clean sheet bonus, which would add considerably to his score. Until he plays in a possession dominant side, we won’t know his true PB value! He has an average Performance Buzz score of 80 at Stuttgart, which won’t really set the world alight. His all time Top PB Scores are 149, 144, 129, 125 & 118. That might be enough to win PB on a single day, but we really need around 165+ from a player to compete for PB. His Media Buzz will be non-existent, as he’s not in the Top 200 players. Albeit, if he was in the Top 200, I doubt he would win Media Buzz, as the Bundesliga really doesn’t get much media attention. Only 3 players contracted to a team in the Bundesliga have won Media Buzz Dividends. Jadon Sancho (A miniscule £0.07), Paco Alcacer (£0.02), Jerome Boateng (£0.05). The above discounts completed transfers, or you can add Pulisic to the above. Stuttgart have an immense Youth Academy, initially having Performance Buzz Icon Joshua Kimmich at their disposal. Unfortunately they only received £8m when Munich came calling. It’s safe to say they can replace Pavard, however skilled he is. In their current squad they have Timo Baumgartl, who is showing that he has the ability to step up to the mark. He has partnered Pavard quite a lot this season. Whereas Pavard is a more natural Ball Playing Defender, mainly due to his ability to play as a Wing Back, Baumgartl is the old fashioned centre back. Still vital in today’s game. I’ve actually taken a nibble on Baumgartl, as he’s almost half the price of Pavard (£1.90 vs £1). Another alternative would be Antonis, however he is 17 years old and pretty raw. I hope Pavard improves his game at Bayern, it will make him more of a ‘PB Player’. It’s an interesting one, as he can play very well as a right back. It’s a move which could push Kimmich into midfield. It’s not a dead cert, it’s just a possibility and I’m sure it’s something they may test out at some point during the season. It has the potential to de-value current Bayern Munich defenders, but it’s all just guesswork at the moment as we don’t know what position he will be consistently playing in. Another thing worth mentioning is that Stuttgart are in the relegation area, only the bottom 2 are automatically relegated in the Bundesliga, but this is a potential cause for concern. If stuttgart are relegated, they are no longer a Performance Buzz eligible club, however, their star players will most likely transfer away to a bigger club.